I am in the program. What's the difference between my username and my nickname, and how do I change them? Your account has two different names: Your username, and your "nickname". Your username is the one that you use to log in with. Your nickname is what is visible to other participants in the program in Chat, Forums, and your user profile. Other participants are not able to see your username, only your nickname. Scroll down to find the Nickname field. Type in the nickname you want, and click the Save button at the bottom. You can change this whenever you want, as many times as you want, and it will update every post you've made in the forums with your new nickname. You are not able to change your Username. If for some reason it is necessary, please contact Jenna Chandler at foundations@rickhanson.net, and she can change it for you. I am trying to reset my password using the password reset link so I can log in but I am having trouble. Go to your email inbox and find the email from The Foundations of Well-Being. (If it does not show up in your inbox after a few minutes, please check your spam folder.) In the email, click on the link. On the Choose a New Password page, type in the password you wish to use in both of the fields. Click the green Log In button. You will now be logged into the website, and your password going forward will be the one that you just set it to. *Note: The next time you log into the site, your web browser may remember your previous password. If the password field is already filled in with dots, but logging in doesn't work, you may have to re-type your password in the password field on the login page. How do I change my password after I have logged in? Click on the "Edit Profile" tab, in the profile page. In the current password field, you will need to put in your current password. Underneath your email address on that page, there will be two more fields to enter the new password that you want. Enter the same password twice. Scroll to the bottom, and click “Save". I need guidance on starting the program. There is a welcome video on the home page which might be helpful in guiding you in starting the program. Enjoy this brief welcome message from Rick, where he talks about how you can get the most of the program, as well as a quick overview on how to use the website. Also, be sure to check out the FWB User Guide. Also, you’ll see along the right, the list of pillars. They ordered chronologically. Where do I start? Is it self-paced? Can I catch-up? How long is the program accessible? You can actually begin wherever feels best for you. That might be where we are in the program now, or that might be at the beginning in the Self-Caring pillar. The program is designed somewhat sequentially with material and concepts building on the material that came before it. That said, we encourage you to engage with the materials at your own pace, in the order and at the depth that works best for you. Please feel free to focus on whatever will help you the most these days. There is no such thing as "falling behind" and many of the participants are already going through the material at a pace that is different than our release dates. 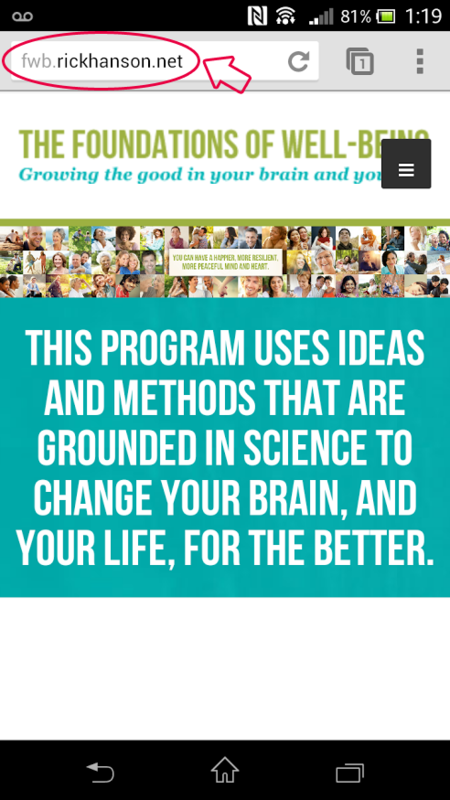 Once you have paid for the program in full, you will have lifetime access. How do I download audio to iTunes on my computer? Right-click on the "Download Audio" button. Choose "Save Link As" or "Download Linked File As…" and a window will open that allows you to choose the location on your computer where you would like to download and save the MP3 file. Once you have chosen a location, click the Save button. After the MP3 has finished downloading, find it on your computer, right-click on it, and choose "Open with... iTunes" - iTunes will open and start playing your MP3. Is it possible to download audio or videos on my iOS device? If you are using a desktop or laptop computer you can download the audio and add it to your iTunes library where you will then be able to load it onto your iOS device (iPhone, iPad, or iPod). Unfortunately if you are navigating Foundations content with only your iOS device, Apple only permits you to stream audio and video, not download it. This means you will need to be on a WiFi connection or use your carrier's data plan. Since iOS does not support downloading MP3s from the browser natively you may want to try a third party app to allow you to download media to your iOS device. Be sure to read all product descriptions and costs before you choose which app you decide to use. How do I know if my internet connection is fast enough? You can test here: http://www.att.com/speedtest. If you are trying to view a video and you do have a slow connection, you might try pressing play and then press pause, then wait for the progress bar to fill up with a grey line, so that the video buffers before you watch it. How do I use the Foundations site on my mobile device? The most recommended browser to use on your phone is Chrome. If it is not already installed on your device, you can download it for free in your app store. In the URL box of your browser, type in www.thefoundationsofwellbeing.com. Now you are at the Foundations website. In the top-right corner, you will notice a black box with three white lines in it. This is where the website navigation lives for mobile devices. 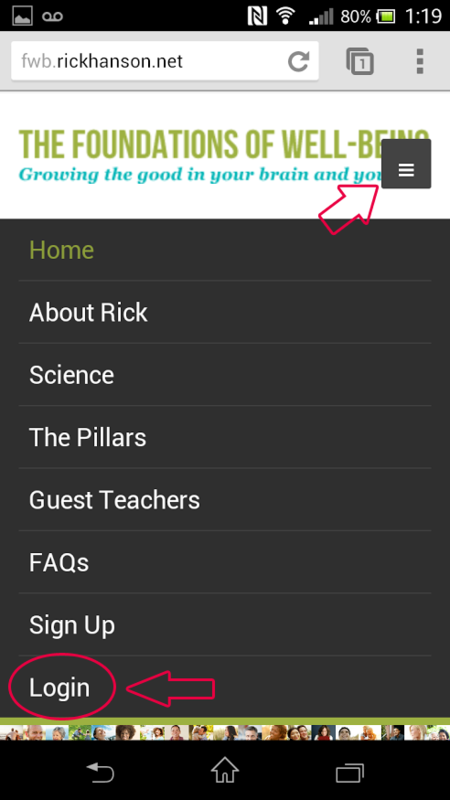 Tap on that, to see a dropdown menu of your navigation options. Tap the "Login" option. Now you are at the login page. If you have already logged into the site before, either on your mobile device or a different device or computer, then scroll down past the message asking if you're logging in for the first time, until you get to the area with fields for your username and password. Type in your username in the Username box, and your password in the Password box, and then tap on the green "Log In" button. Now you are logged into the site, and you will see your profile page. 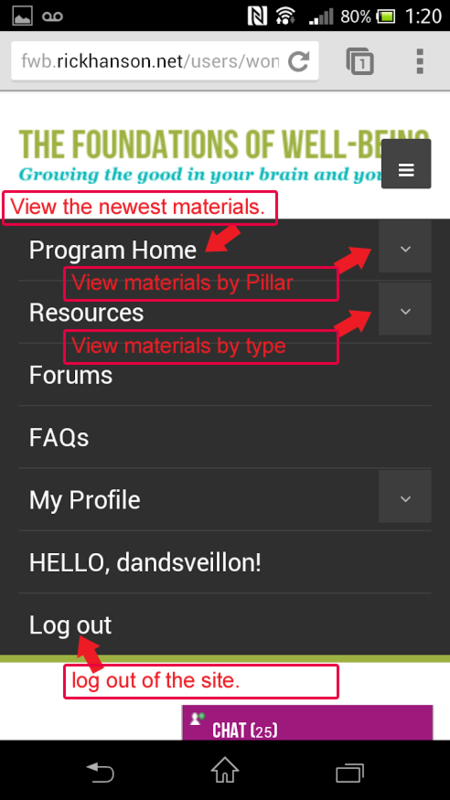 To get to the program materials, tap on the black box in the top right corner again, and from the dropdown menu, choose "Program Home" to view the program home page, which will show you the newest offerings, or tap on "Resources" to view the materials by content type: Presentations, Practices, Interviews, etc. 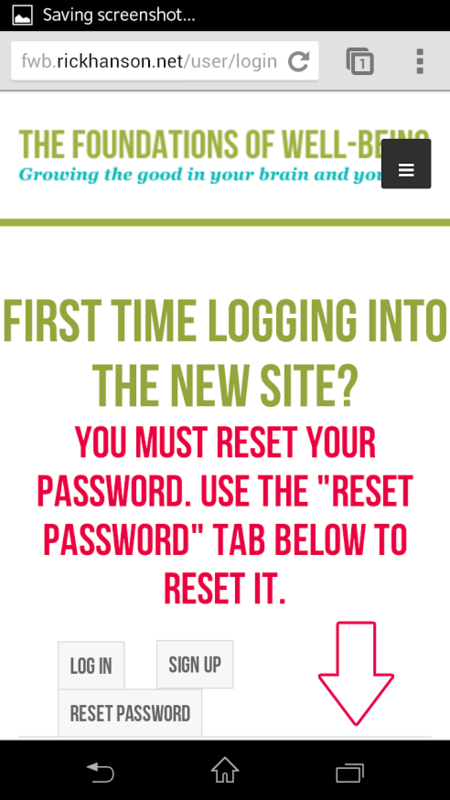 If you do not log out of the site, the next time you visit www.thefoundationsofwellbeing.com using Chrome on this device, you will already be logged in. Another benefit to staying logged in to the site is that when you tap on the links in your emails, you will go to the correct page. If you logout, tapping on the links in the email may not work for you, and you will see a message that says "You are not authorized to access this page." 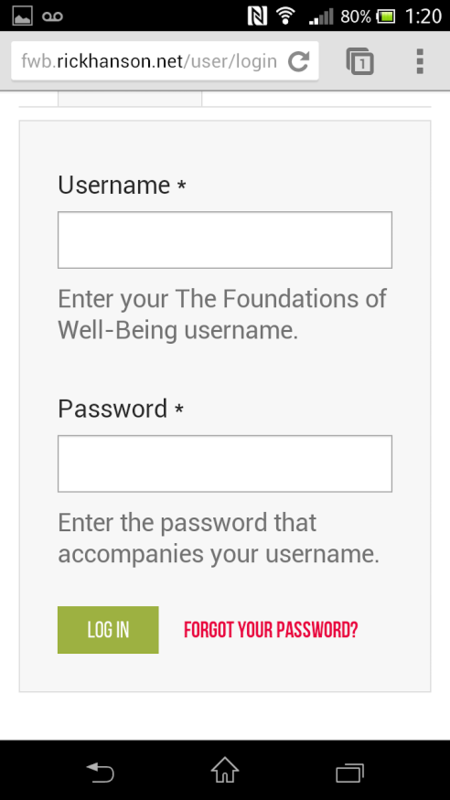 Log in to the site here: https://www.thefoundationsofwellbeing.com/user/login. 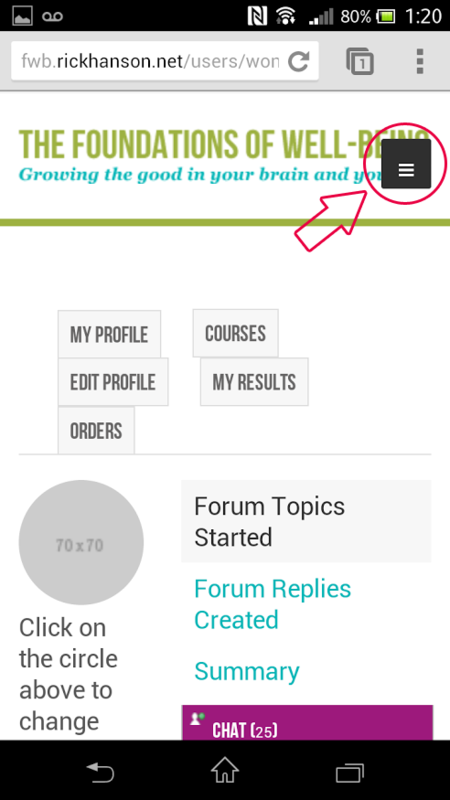 Once you are logged in, please click on "My Profile" at the top of the website, in the navigation bar. On your profile page, click on the tab that says "Update Your Card". Enter your new card information, and click the green "Update Your Card" button. Send us an email at foundations@rickhanson.net. Whether you are using a PC or a Mac. What page you are visiting when you have this problem (please include the url). Specific details of what you are experiencing. I signed up for the monthly plan. Can I pay off the rest of my tuition at the full-payment plan price? Login with your Foundations username and password. Once you are logged in, click on "My Profile" in the top menu bar of the website. Then, choose the "Convert to Full Plan" tab on your profile page. On this page you will see the amount left to pay if you want to convert to the full-payment plan. This takes into account everything you've already paid. 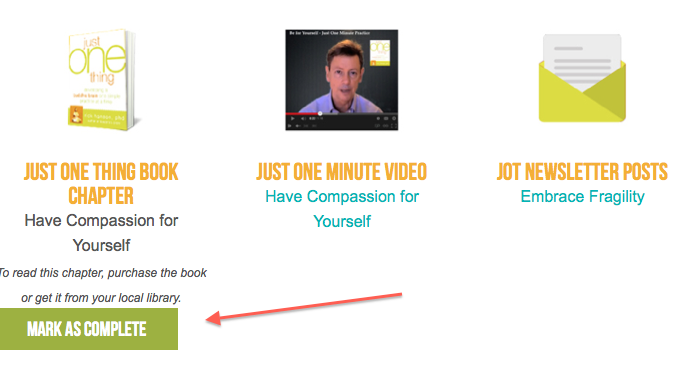 Simply click the green "convert" button. If you simply paid using a credit card, you will get a message announcing your successful conversion, and you will see a charge on your credit card for the pay-off amount. You will no longer be charged monthly payments. If you paid using PayPal, you will be directed to a PayPal to finish your transaction. Once you are finished, you will no longer be charged monthly payments. I am thinking about joining the foundations program. The registration page isn’t accepting my registration. What should I do? You might try refreshing or updating your internet browser, or try registering on a different internet browser or device. Can I get a feeling for the program before committing? We offer a 30-day money-back guarantee. So if you try to program for 30 days, and you find that it is not for you, simply send us an email and we'll issue you a full refund. You can actually begin wherever feels best for you. That might be where we are in the program now, or that might be at the beginning in the Self-Caring pillar. The program is designed somewhat sequentially with material and concepts building on the material that came before it. When you join you’ll see a Welcome video that will give you more information about engaging with the program in the way that feels right for you. We encourage you to engage with the materials at your own pace, in the order and at the depth that works best for you. Please feel free to focus on whatever will help you the most these days. There is no such thing as "falling behind" and many of the participants are already going through the material at a pace that is different than our release dates. When you join you’ll see a Welcome video that will give you more information about engaging with the program in the way that feels right for you. How long is the program accessible?